As the baisa bus drove us to our next meeting, the rest of the students and I were a bit confused about what was happening. The itinerary wasn’t set in stone to begin with, but some things had just been moved around, leaving us pretty unaware about what to expect of our next stop. The driver pulled up to what looked like someone’s home—a very large home, at that—and we were greeted by an Omani man who gestured for us to come inside. Our eyes grew huge in amazement at the palace before us. I’ve seen many large homes and mansions, but this was practically royal in its grandeur. We later learned that we were sitting in the home of H.E. Sheikh Abdullah bin Salim Al-Rowas, a former minister in the Omani government. Joining us was Richard Baltimore, former U.S. Ambassador to Oman, and Jihan Abdullah Mohammed Al Lamki, a news anchor on Oman TV and member of the National Human Rights Commission (Jihan’s adorable son joined us as well). After introducing ourselves and enjoying a few fresh fruit smoothies, the other girls and I moved to the other side of the room to converse with Jihan. 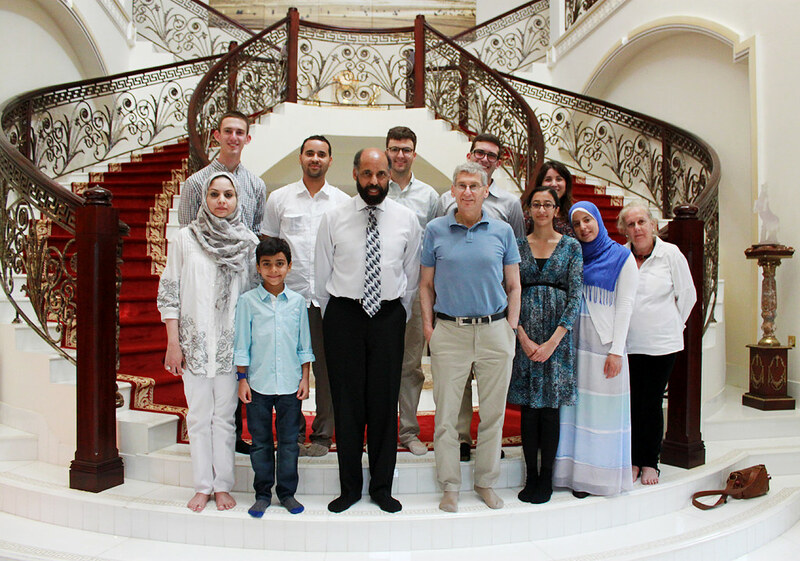 The group poses in Sheikh Abdullah’s home, with (starting from front left) Jihan, her son, and Richard Baltimore. As I noted, Jihan has a young son but also has two important, fully-engaging jobs. She told us that Omani women usually work—they are capable of having both jobs and children, even though men generally don’t help them around the home. This, she says, is because maids are paid much lower wages here, making them affordable and accessible to more people. To be honest: yes, it’s great that so many women work in this country, but I’m still disconcerted by the fact that it’s largely due to the sub-par status of migrant workers—a problem all throughout the Arab world (though, in Pakistan, even many poor families have maids, who are even poorer than they are). What about those women, who work long hours for little pay? Can they have kids, and if so, who cares for their kids? It’s certainly not a completely positive development. Regarding the status of the female population in general, Jihan said that, in Oman, women are equal to men—and the Sultan, who we’ve learned is quite progressive, is good to women. She even said that women can walk anywhere around the country and be safe (I don’t know how true that is, but it’s telling enough that she would claim it, since I can’t even say that about the U.S.). She also told us that she is one of three women the Sultan picked for the Human Rights Commission. And on Oman TV, she’ll be hosting a special program on successful Omani women, which is pretty cool. We asked Jihan how Omani women view American women, to which she replied, “we just view American women’s lives as different.” She’s been to the U.S. and noticed that Americans don’t really know anything about Oman; she tells them it’s near Saudi Arabia, and upon hearing that they think, “Oh, Saudi Arabia—like Osama bin Laden?” Despite their initial ignorance, however, Americans are curious and really do want to learn more, Jihan told us. Embarrassed by the often-expressed observation of my country, I was glad to hear that there was still something redeeming to make up for the deficit. Jihan also told us that she believes the U.S. is “very modernized,” but we have a “war-loving media,” which causes people not to know important truths. Speaking of modernization, Jihan has been to Dubai as well—an Emirate in which, she said, “you don’t see Emirati culture.” There is such a huge expat population and so much “modernization” that Arab culture is now invisible there, in her view. She compared this to Oman, where the people are modernized but they still have their culture, dress, etc. I noticed the same thing traveling between the two countries. It may have to do with the path by which the countries modernized, or the goals they sought in the process—I really don’t know—but the cultural disparity between these two modernized nations is worth noting. Lucky for me and Jake, we were seated right next to Ambassador Richard Baltimore, who quite possibly might be the most interesting man I’ve ever met. Ambassador Baltimore, or just Richard, told us all about his life and time in the American foreign service. I COULD NOT have been happier to learn that he went to New Rochelle High School, my very own alma mater, and is a very proud graduate and alumni himself. He wanted to hear all about the school, the city, and my time at NRHS (he even asked about SUPA Forensics after reading about it in the news)! We had a true bonding experience. But actually. Richard, after graduating from NRHS, went to GW for International Relations and then Harvard Law School (not because he wanted to be a lawyer, but because he wanted a fallback in case he didn’t like the foreign service) before becoming a Political Officer at the Department of State originally stationed in Portugal. Despite being initially unexcited by this placement, within 10 months of his appointment there, Civil War broke out and he said it was the greatest place to be working. Richard was in South Africa during Apartheid (in 1976 during the Soweto uprising), in Egypt when Sadat was assassinated, worked in Hungary with dissidents, volunteered in Afghanistan, served under 3 different Secretaries of State (Vance, Muskie, and Hage), and ultimately served as US Ambassador to Oman. Oh my God, this man could possibly be my hero. He was charismatic, funny, extremely knowledgeable (when asked how many languages he spoke, he told us we didn’t even want to know, and over the course of the conversation spit out fluent Afrikaans and Arabic), and just an all-around fantastic guy. Currently, he works for Omran, an Omani government-owned company that focuses on the development of Oman’s tourism industry. After our conversations, we sat in Sheikh Abdullah’s dining room for a meal that only be described as grand; so many different dishes, and so much of each, amounting to more food than I’d ever seen in any place other than a restaurant. Throughout our whole visit, really, the Sheikh was so hospitable—epitomizing the welcoming, gracious Omani culture we experienced throughout our stay. Afterwards, we chatted some more over tea (really good tea, I should add), and Jake G. even tried out his Arabic skills by semi-conversing with Jihan’s third-grade son. Before leaving, we took a group photo (excluding the Sheikh, who for some reason was hesitant to join in). This is the only photo I have from the house—though some of the other students took more—because I just felt uncomfortable taking pictures of someone’s home, as if it was a tourist attraction. It was really a beautiful home, but, more importantly, in it we had great conversations with some of the people who are shaping Oman today. 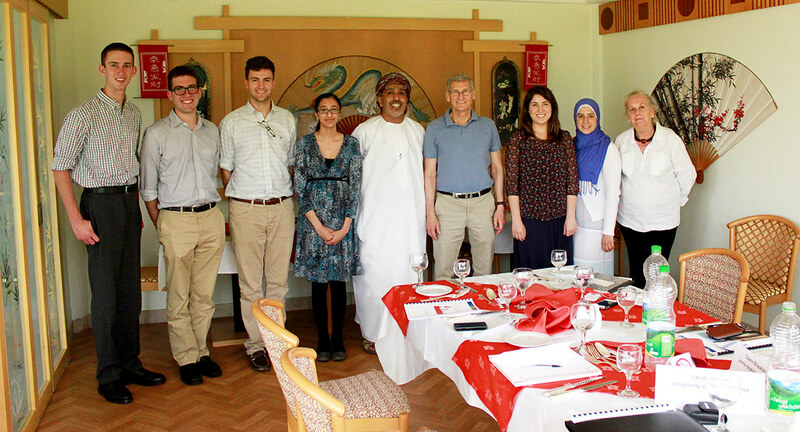 After lunch, we headed back to the hotel to meet with Ahmed Ali M. Al-Mukhaini, a former expert with the Omani State Council who describes himself as an “independent researcher,” for various Omani organizations or the UN. He focuses on human rights, especially women’s rights—yes, this early in the conversation, we already knew he was awesome. And even more awesomely, before delving into discussion, he told us: “Don’t take my words at face value. Always ask me why, until I say I don’t know.” That’s good advice for any discussion, but it’s even better that he himself told us to think as critically as possible. The group poses with Ahmed Al-Mukhaini. Ahmed chose to talk broadly about three things: the political landscape of Oman, the Omani Spring, and shari’a law. The last one, he noted, was something important to discuss with Americans in the context of “sharia” becoming such a dirty concept in U.S. politics. 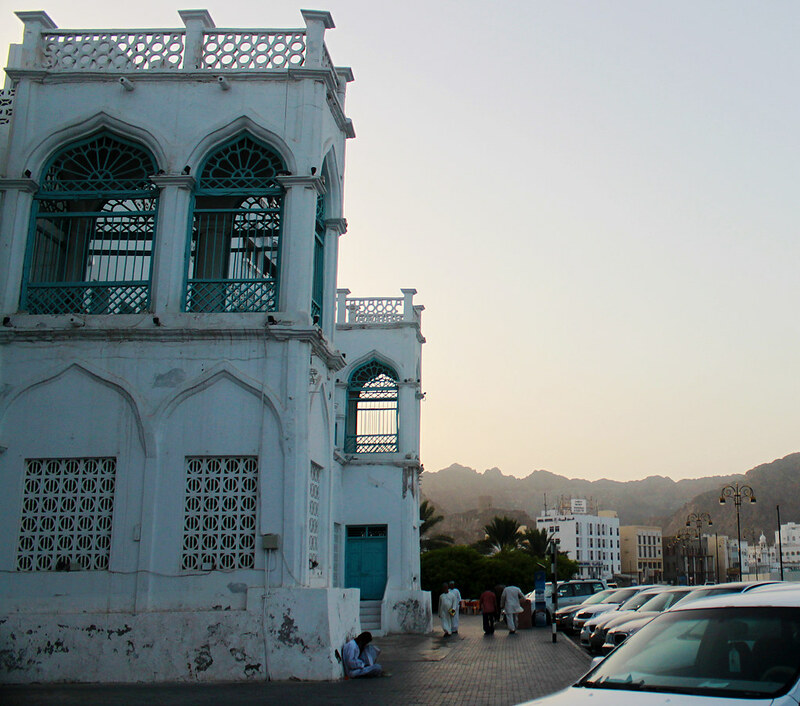 First, the political landscape of Oman. According to Ahmed, the tribe is the only social organization structure in Oman—there are no civil society or interest groups. Tribal leaders work with the government, which creates and divides tribes itself. The government, an absolute monarchy, gains its legitimacy from tribes. Things are a little different now, but you were able to guess someone’s location, facial features solely from their name (as it indicated their tribe). In the past, inter-tribal marriage never happened because people viewed their tribe as better than or “above” the others—one tribe may not even marry into the royal family—but things have changed now that people are concerned about influence and money. Ahmed noted that such social guilt is rare in the U.S., where people are more individualistic and less concerned with shaming their family. The Sultan is the ultimate leader of the country and makes all of the final decisions—but there are two chambers of the government which help and advise him: the Council of Ministers and the Council of Oman. The Council of Oman is somewhat the legislative branch, except that it doesn’t actually have legislative power—that lies solely in the Sultan. This chamber has two houses: the State Council, the members of which are appointed, and the Majlis A’Shura, which has members that are elected in votes collected through the Chamber of Tribes. The Sultan appoints many women to the State Council in order to counter the smaller number of women elected to the Majlis A’Shura, assuring that minorities are represented. The quasi-representative Council of Oman has grown more powerful after the Arab Spring, with the State Council becoming the “gateway to the Sultan.” Because it doesn’t have real legislative power, this chamber as a whole is more of an advisory group, for consultation as well as representation of the Omani people. On the other hand, the Council of Ministers—the executive branch—is entirely responsible to the Sultan, not the population. It has, however, become much more transparent after the Arab Spring. 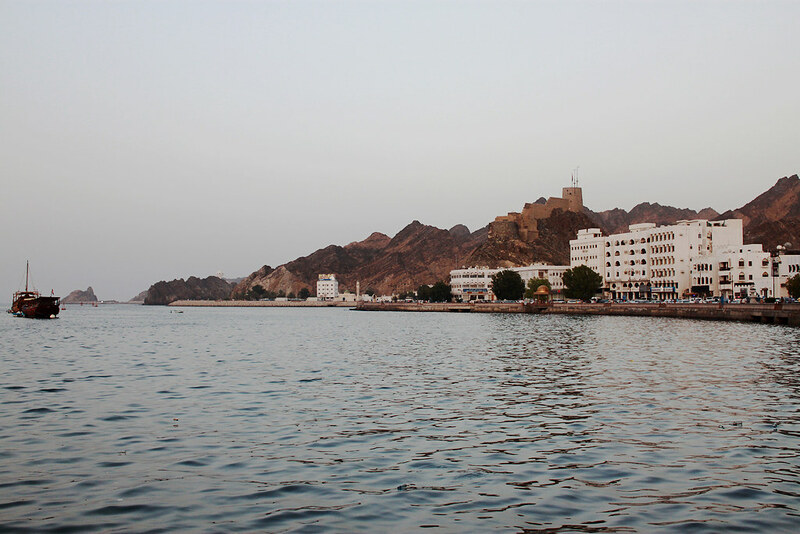 The Arab Spring has affected Oman in certain ways, which Ahmed discussed later in the conversation. On the subject of women’s rights—there have been four Omani elections by universal suffrage since 2000. In 1972, Oman became the first Arab country to have female police and army officers. Currently, Omanis are working to fight gender bias in employment. And as noted earlier, despite the fact that women can stand for election to the Majlis A’Shura, they are voted into power in smaller numbers than men, so there are clearly still strides to be made (but the same goes for the U.S.). Overall, the Sultan is trying to improve the public image of Oman. He must be doing a good job, because the image and reality in Oman is quite bright relative to most of its neighbors. The Sultan of Oman, Qaboos bin Said Al Said. 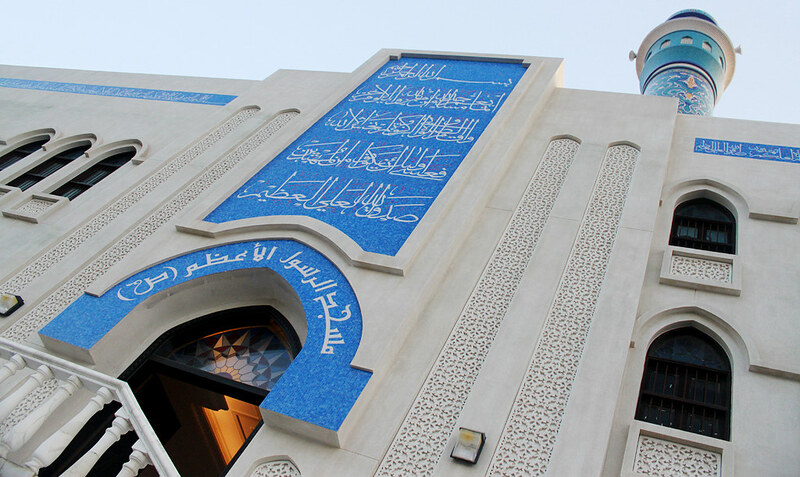 Photo from the Omani Ministry of Information. Sultan Qaboos has ruled Oman since the coup that subverted his father in 1970, but he is now over 70 years old, so the country has to plan for the future of their leadership. But the Sultan is highly revered by his people, so his succession is a sensitive issue. Officially, within three days after the Sultan’s death, his family is supposed to choose his successor—but if they fail to decide, they open his will, in which he has named his choice to succeed him. This name is kept private, for obvious reasons, and its revelation is authorized with the presence of the Defense Ministry and the Council of Oman. Anyone in the Sultan’s family could become the future ruler, but there are no obvious candidates—namely, the Sultan never married and has no children. There are rumored reasons for this, which I’ll talk about in a future post, but it has caused great uncertainty for the Omani people. The Sultan is also an especially progressive ruler, who listens and responds to his people, embodying the ideal of the “Enlightened monarch”—some fear the possibility that a future leader won’t be as great as he was. According to Ahmed, there are calls for Oman to establish a constitutional monarchy, making the future Sultan into a figurehead and giving representative officials the real power of governance. This would also entail writing an actual constitution, which Oman does not currently have—there is only a set of Basic Laws. Right now, the Sultan sits strongly on his throne, but it is possible that change will come sooner or later—perhaps with the help of the Arab Spring. On that note, we began the discussion of the Omani Spring. Oman used to be ruled by an elected Imam until a war in which the Brits helped the monarchy win. All three major schools of thought in Oman—Shi’a, Muslim Brotherhood, and Ibadi—tried to revert the monarchy back to the system of the Imam, but they had no social support, as people were unsure under which group they’d be better off. Now, however, as Omanis were unsure whether it was safe to rock the boat, the Omani Spring moved from a religious to a civil, secular, pluralist effort. Omanis asked for a new constitution where the Sultan still has powers, but institutions are separated—and this path has begun. 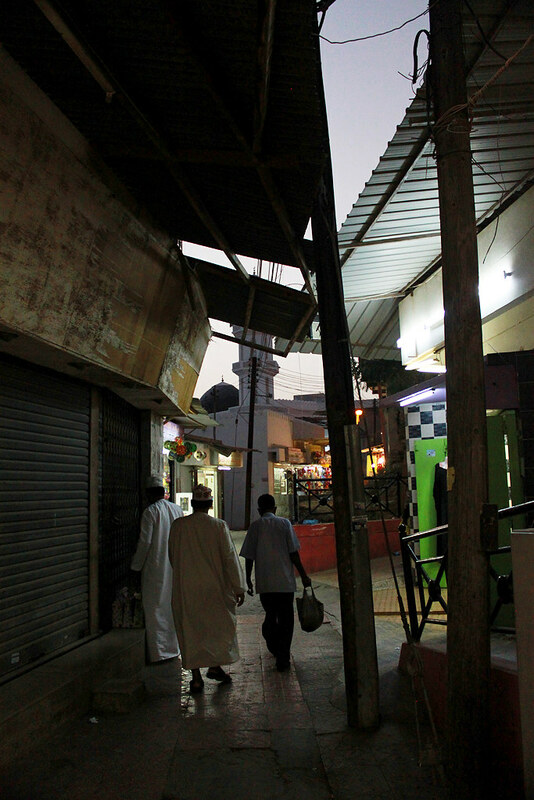 Ahmed said that the Spring happened because of Oman’s powerless institutions; all of the power lied within three cuts, and people couldn’t work without personal connections, causing them to lose faith in the system. There were substantial “gaps,” Ahmed told us, in Omani governance: a “hope and social justice” gap, as economic inequality rose with some people’s accumulation of massive wealth, and a generational gap, which begged the question, “why don’t young Omanis rise against?” He said there were a couple of reasons for this: they couldn’t criticize the government without being removed from office, some were just apathetic, others didn’t want to rock the boat, and many had jobs. When a man was attacked and killed during a riot on February 25th last year, it caused a “wave of discussion” about the problems facing Oman. The Sultan responded well and took note of people’s complaints, changing policy accordingly, and there was no more “fear war” because of the emergence of civil society. The apathy of Omanis actually turned into over-involvement, as people began wanting to have a say in every single decision. In this sense, the Omani Spring did bring real change. Now, to the final (planned) subject of discussion: shari’a law. Ahmed started by pointing out that not all Muslim countries apply shari’a, and countries like Saudi Arabia, Pakistan, Iraq, and Somalia apply it to greater degrees. And contrary to popular belief, shari’a is “not a penal law system”—it has principles and rules, but it is very flexible. Shari’a developed when Islam was hierarchical, with caliphs and all. When the Muslims were kicked out of Spain, however, they had to consider how to use shari’a law when ruled by non-Muslims. Now, people are trying to make shari’a more in line with modern law—in fact, modern consensus-building is enshrined in shari’a! He even noted that there is an extent to which the U.S. Supreme Court uses other laws for reference—including, yes, rabbinical and shari’a law. Ahmed asserted that, in this sense, all of the world’s laws are converging to the same understanding. Even parliaments in the West are moving from majoritarian decisions to consensus-building, which, as he told us, shari’a does too. Ahmed didn’t get too deep into the details of what exactly shari’a law dictates, but he showed us that it’s not as simple and radical as American politicians and the media often portray it. We asked Ahmed a few questions that prompted rather interesting answers. He revealed that he believes Oman will have a prime minister by the end of the year, a new constitution in 18 months, and only a marginal role for the Sultan like that of the British queen, moving toward a constitutional system. He highlighted a difference between the Omani Spring and the Arab Spring in general: no one challenged the Sultan’s legitimacy, they just asked for him to intervene—the blame was placed on the ministers. The Sultan of Oman was the only Arab leader whose legitimacy was actually renewed by these events. The Sultan is quite unlike any other, and Ahmed believes he could recognize his own uniqueness, allowing the system to change upon his death. Someone in our group also asked about the relationship between Oman and Israel. Ahmed told us that Omanis don’t really doubt Israel’s right to exist—it is Levantine, not Omani, generals who flare up the issue more. This left us wondering if the Sultan could help resolve the conflict. But Ahmed revealed to us that he himself was once involved in the conflict, but left because he saw people’s will dying on both sides—which reminded me of the “exes” that Mark talked about during orientation. We took our photos, said our goodbyes, then (finally) got a chance to relax after this busy, knowledge-filled day. I don’t think my memory could even process the fact that all of this happened within less than 24 hours, because I started writing with the impression that we did these things on at least two different days—until I looked at my notes and photos and realized otherwise. Actually, even at this point, the end of the day had yet to come. After our short break, we visited the souq (market) in Muttrah to look around and shop. 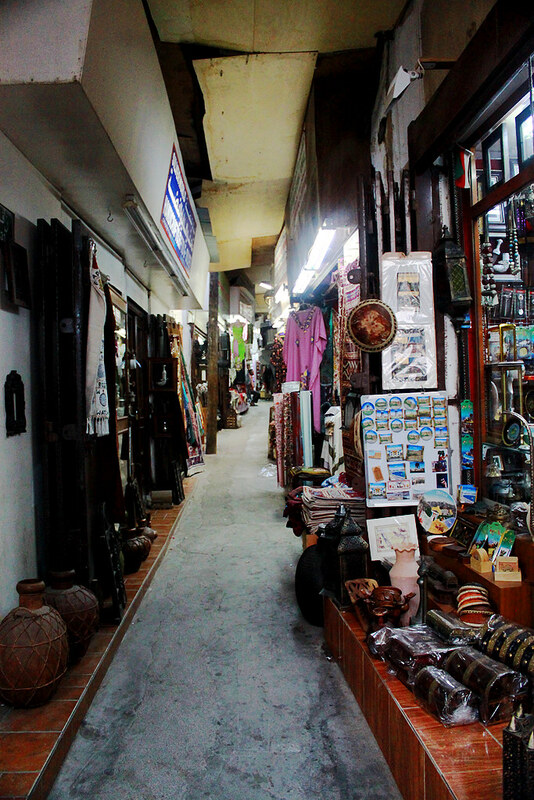 Walking through the Muttrah souq, one of the oldest souqs in Oman. A beautiful Shi’a mosque at the harbor. There was a sign saying that only Shi’a Muslims could enter, which contradicted how we were told earlier that anyone can enter a mosque. 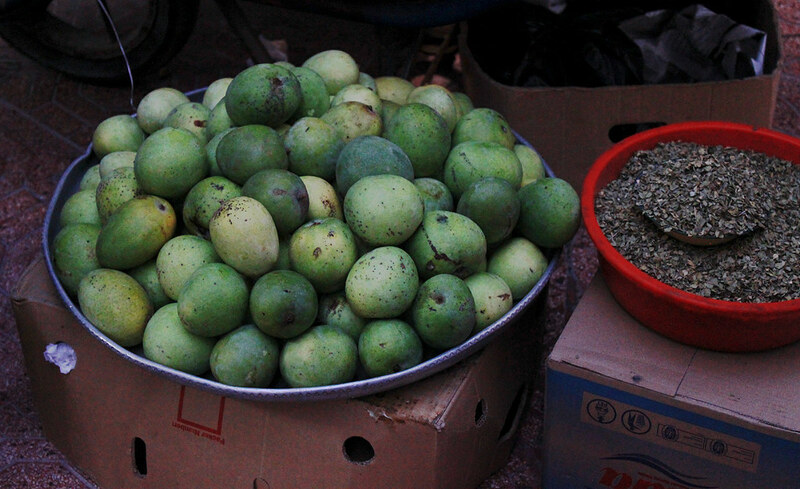 Mangos for sale. Most of the Arab world imports their mangos from India and Pakistan—my father even told me to make sure I “eat some good mangos” during my trip, since the U.S. does not import Pakistani mangos (which are widely regarded as the best in the world). The narrow alleys of the market, lined with shops that sell everything from books to produce. It is not unusual to see men in this part of the world holding hands, which indicates friendship, unlike in America. 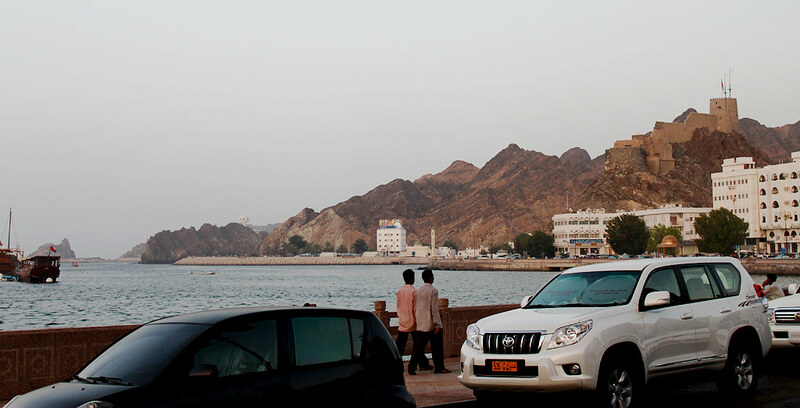 That brown structure in the distance, blending into the mountains, is the Muttrah Fort, which was built by the Portuguese, overlooking the Muttrah harbor. The souq grows more beautiful at night. 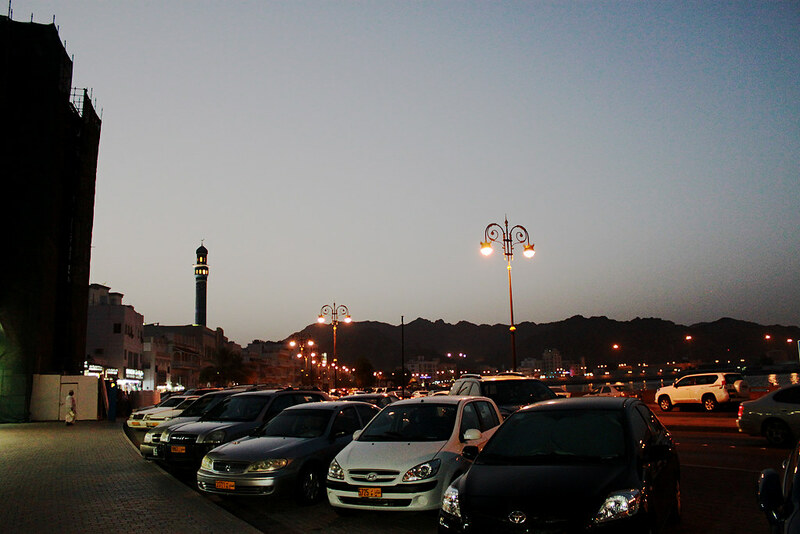 Cars line up in front of the souq. You can see the minaret of the Shi’a mosque in the background. 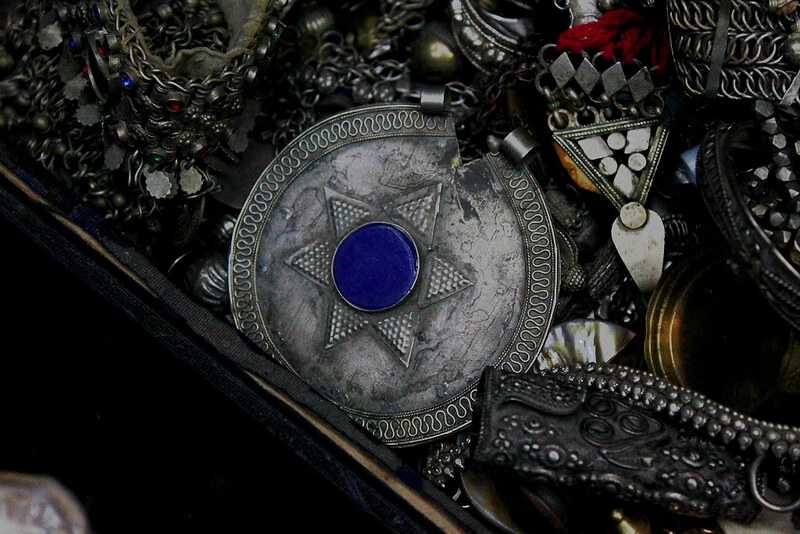 I bought one thing from a shop here: a silver charm of a khanjar. The khanjar is the traditional dagger of Oman, which appears on both its flag and national emblem. First of all, the charm was cute, with the top sliding out to reveal the “blade” (really, a dull point that couldn’t hurt anyone, unlike in a real khanjar). Also, I wanted a souvenir I couldn’t get elsewhere, something truly Omani, something that would evoke memories of this beautiful country—and this was perfect. Every second, 4 women in the world give birth, and 1 of them dies. Maternal mortality is three to four times higher among the poor compared to the rich in Indonesia. In Sweden, the maternal mortality rate is 1 in 17,400 births, but in Afghanistan, it is 1 in 8. In Bolivia, a mother with no education has a 10% chance of dying during birth, whereas the chance of a mother with at least secondary education dying is less than half of 1%. 100 years is now the average life expectancy in the wealthiest countries of the world. The life expectancy for aboriginal Australians is 17 years shorter than that of other Australians. 60% of all deaths are caused by non-communicable diseases. 90% of the visually impaired live in low-income countries. An even bigger problem, he pointed out, is the global challenge of mental health. 13% of the burden of all diseases comes from mental illnesses. In many parts of the world, people just aren’t aware of psychological or neurological illness as real diseases—for example, some people see epilepsy as the “devil entering the body” (I can imagine how hard it must be for schizophrenics in certain places as well). He said that here, in the Arab world, mental illness is a huge problem, particularly because “people don’t talk about it”—there is a pervasive stigma looming over mental illness in the West, but it’s even worse elsewhere. Daar is on the executive committee of an initiative called Grand Challenges in Global Mental Health, which seeks to spread awareness about these problems and work towards overcoming them. Mental health is an issue I really care about, especially on a global level where it’s often more neglected. I salute him and the rest of the group for dedicating such an effort to the cause. He talked about the monetary wastefulness of such bad healthcare—like a vaccine for hepatitis A costing $15 when should be sold for only $0.25. He noted that, in 1960, South Korea was poorer than Kenya—now, it is one of the wealthiest nations, and it spends money on research and development itself. And—cue the embarrassment—“there is no country that wastes money quite as much as the U.S. does.” He complained about the various problems in our healthcare system: defensive medicine that asks, “how can I get away with this without being sued?”; people getting too much testing; and financing problems due to the 3rd party payer system, where they just pick the most expensive medication and don’t care. He said we need to address how to regulate the system, make people do the right thing, and stop companies from going “from profits to greed—because there is a difference” between the two. On the other hand, “Oman,” he told us, “is wealthy enough to be the primary provider” of healthcare. Currently such costs make up only about 4% of their GDP, making them #1 in cost-effectiveness/”bang for the buck,” according to a report by the World Health Organization. He also talked about using zakaat (a pillar of Islam, by which Muslims give a fixed portion of their income to charity) to fund health efforts as well. The importance of these issues can be summed up with a quote by Martin Luther King Jr., which Daar relayed to us: “Whatever affects one directly, affects all indirectly.” This is a philosophy that applies to our global conscience in general, whether it be about health or politics, or somewhere in between. A video in which Prof. Daar and Peter Singer talk about the book they wrote on this subject. After this eye-opening discussion, it was time for dinner. We chose an Italian restaurant (so wrong, I know) near our hotel, where we shared stories and laughed until we were too tired to continue. At this point of the trip, our bonds with each other had already solidified. We also debriefed a little on our first full day in Oman, raving about the kindness of everyone we met, the religious tolerance, the political climate, and what was coming next. As I think back while writing this post, I still can’t believe how much happened in just one day, between breakfast and dinner. In less than 24 hours, we learned so much about the country and really grew to love it. Still, with only two and a half more days to go, there was much more left to see.